High above Loch Vale in Rocky Mountain National Park, Lake of Glass and Sky Pond can be found. 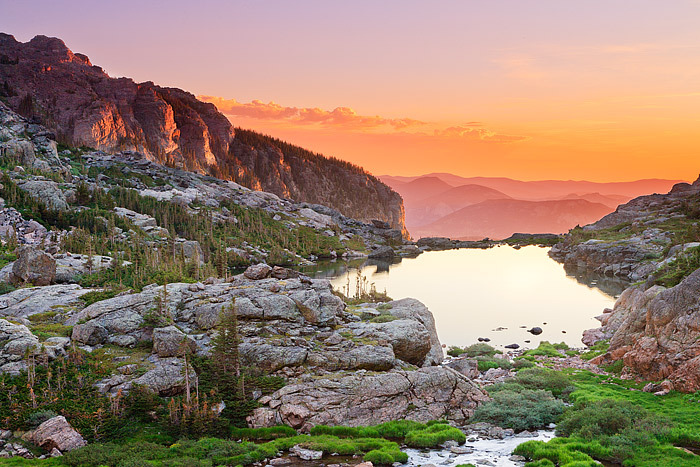 Rocky Mountain National Park is filled with beautiful alpine scenery but Lake of Glass and Sky Pond present the visitor with idyllic Colorado alpine scenery. This area is both a beautiful area to photograph and is world renown with mountain climbers who attempt to tackle and climb formations such as the 'Sharkstooth' and the 'Petit Grepon'. Photographing sunrise from Sky Pond looking back over Lake of Glass is one of my favorite things to do and makes the 4.5 mile hike from the Glacier Gorge trailhead well worth the effort involved. Photo © copyright by Thomas Mangan.